In 2014, the artist Janet Zweig invited me to collaborate on a public commission in Milwaukee, Wisconsin titled Pedestrian Drama. Zweig had begun the project three years before, installing as she describes it, “5 kiosks on five lamp poles each showing three interconnected photographic animations, printed on successive flaps of train flap signs. The flaps turn and display the dramas like a flip book. 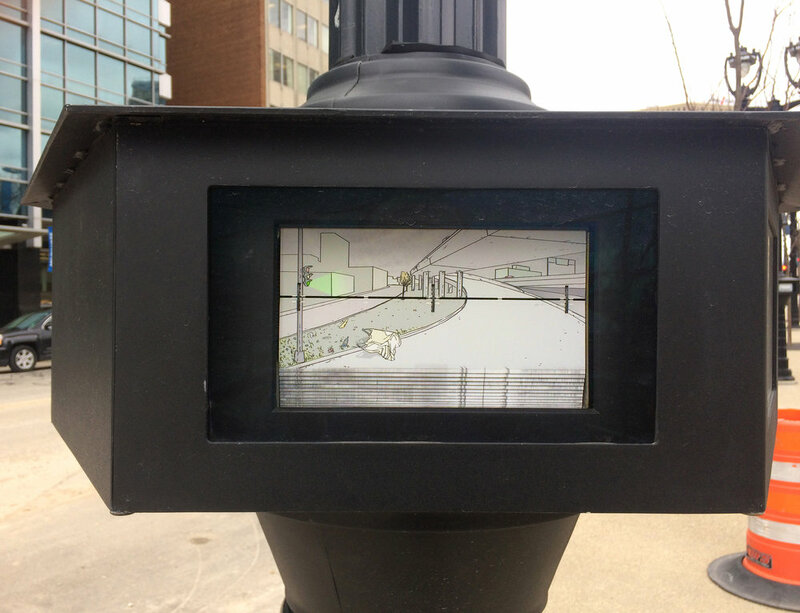 They are triggered by motion detectors when pedestrians pass by.” For the first iteration of the animation, Zweig worked with the local population: “This project was a collaboration with more than 100 Milwaukeeans. We held a contest for ideas for the dramas, hired directors and performers, both professional and amateur, and filmed the dramas in Milwaukee.” Interested in creating several different animations that could be installed on a rotational basis, Zweig reached out to me. Zweig felt my drawing style, with its bright colors and a bold key image, would lend itself easily to animation. She was also interesting in having me depict the types of things I noticed in urban landscapes. She wanted my animation to represent a grittier reflection of the city of Milwaukee. I spent the summer of 2014 creating the animations. I worked closely with an animator, named Jimmy Simpson (www.jimmy-simpson.com). From concept to storyboards to all the actual drawing, I developed 15 animations which depicted five different ways of traveling through the city, each from three different vantage points. Working from photographs and Google Street View, I drew many, many examples of everyday street objects, or “assets” (to use the jargon of animation), and a series of very long drawings that served as backdrops, all of which were put intomotion inside of Adobe After Effects. Each animation needed to have 60 frames at 7 frames per second, lasting about 9 seconds each. Once the animating was complete, the animations were then broken down into stills totaling 900 sequential images. Each image was printed using a UV digital inkjet printer onto special die-cut flaps of plastic. 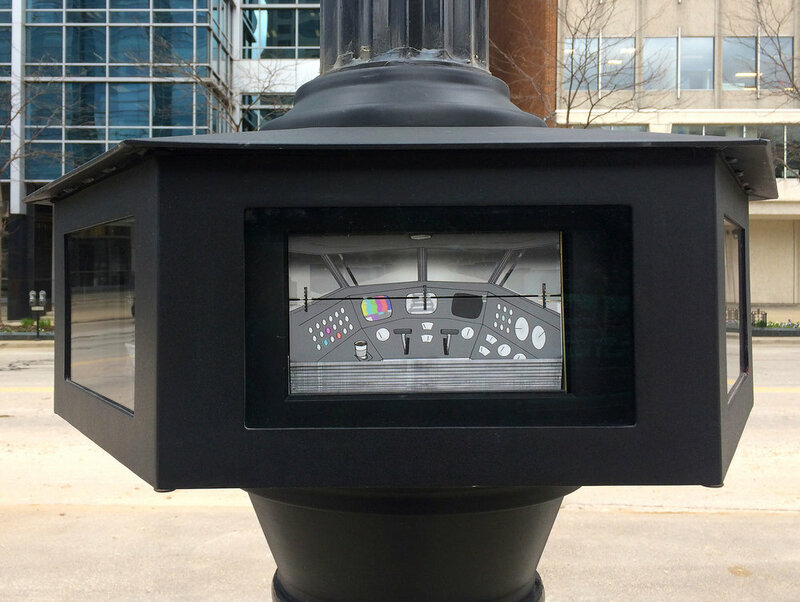 The flaps were installed in the mechanical kiosks in Milwaukee in Fall 2015 for their first rotation.